An error is triggered when a non-virtual class does not implement all the inherited pure virtual methods. Place the editor cursor on the error's line and press Ctrl + 1, select Implement Missing Pure Virtual Methods from the list of quick fix proposals and press Enter. 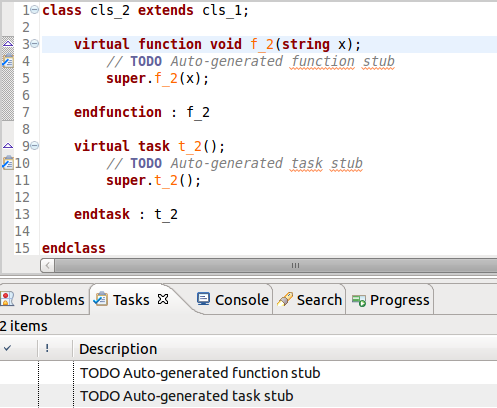 Note: The implementation stubs contain a TODO reminder which shows up the Tasks View. See Track Tasks using TODO Markers.